Note: Living can be viewed only 5 times. 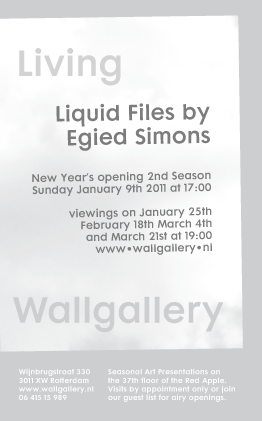 Living presents the recent work of Egied Simons in which he investigates the insignificant, unseen and trivial. He literally zooms in on matter that surrounds us. In his artistic search he frames living or dead stuff looking for the right composition and drawing. Development and transformation play an important role in the process orientated art that he refers to as Liquid Files. Egied considers the results of his elementary research the culmination of all phases of his career as visual artist, all his motives come together in Liquid Files. In the near future the work will evolve into commodities but in Wallgallery Egied focuses on its architecture for showing and living. Wallgallery is not a commercial enterprise nor a hobby, but a radical concept to live with and promote art. It is space for art inside the privacy of a lofty apartment in The Red Apple in Rotterdam. A rough concrete wall high in the sky defines the room, it screens off the outside world. It also offers backcover for the panoramic views and can hold an experimental vision. Every season an exchange of art -or whatever idea transformed into reality- takes place in an open minded environment. Each presentation aims at turning views into vision. This entry was posted on 31/10/2010 at 11:49 and is filed under information, programme. You can follow any responses to this entry through the RSS 2.0 feed. You can leave a response, or trackback from your own site.